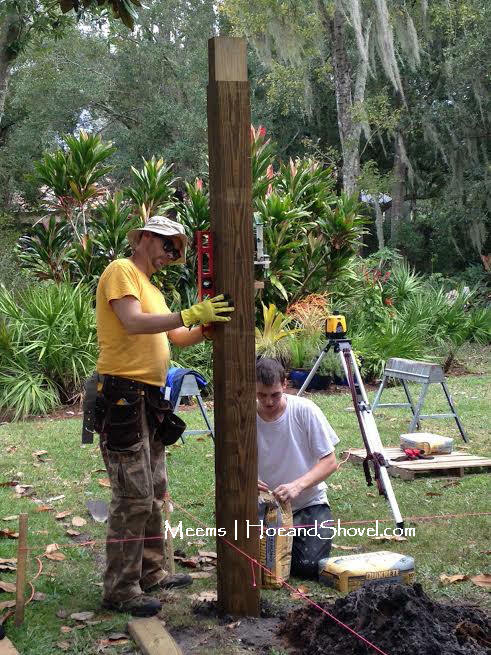 An even bigger dream all along had been to install a pergola structure. There was that perfect spot just outside of the pool cage at my previous house/garden. 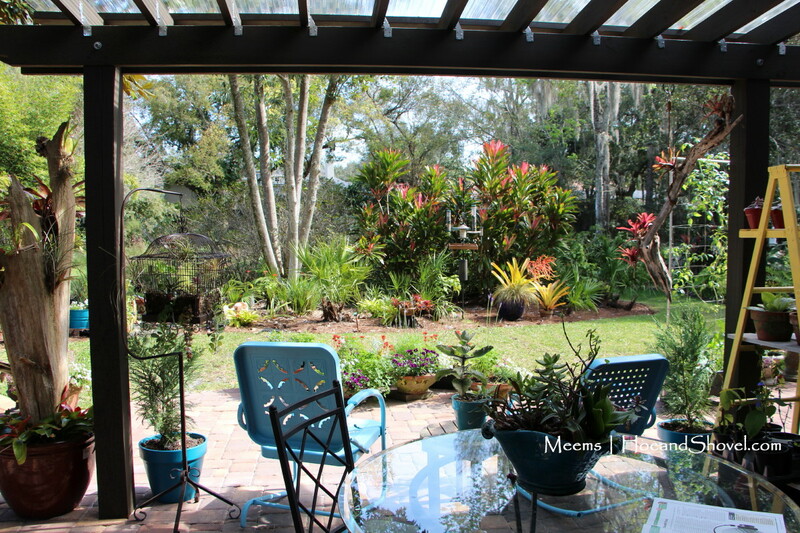 It is a good-size brick paver patio that transitions the screened lanai to the yard. 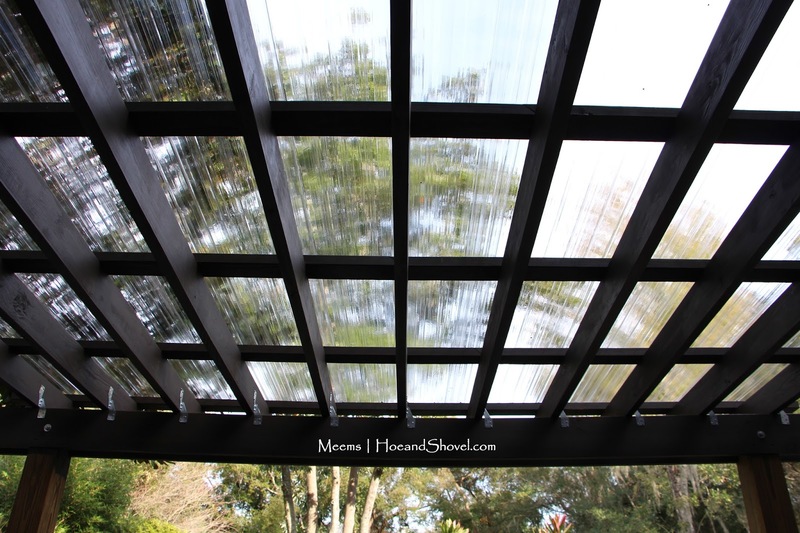 It is the perfect setting for a pergola. I dreamed about it. I talked about it. I could see it in my mind. It didn't happen. Now I don't live there anymore. We did it. 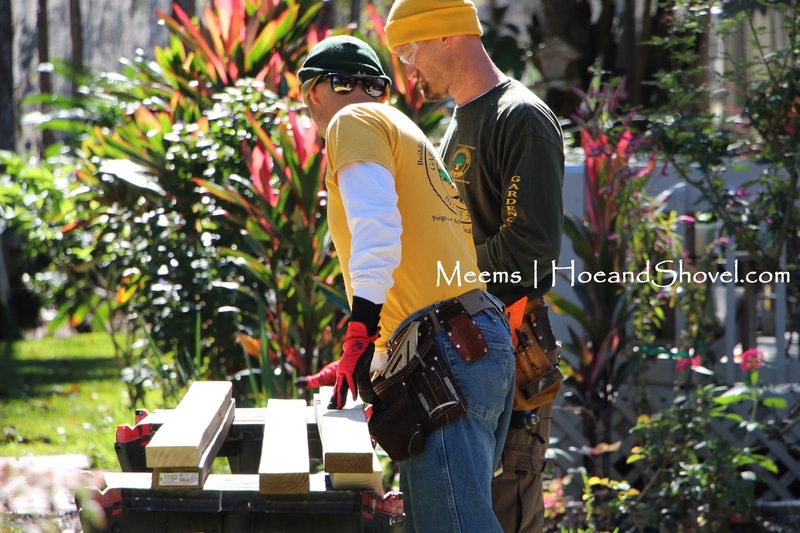 We hired a local company, Garden Carpentry, to build our pergola. I had talked them a few years ago about doing something in my old garden. The timing wasn't right then. Now I know why. There was some preliminary work to do before the pergola could be installed. 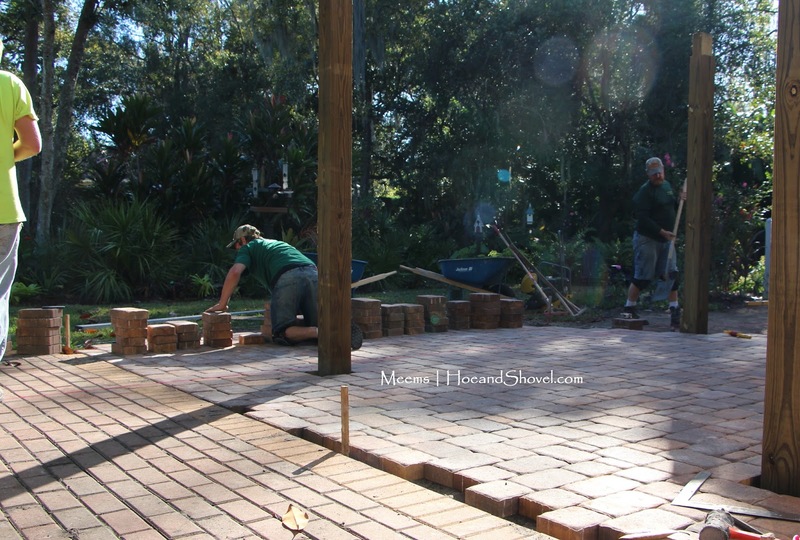 Brick pavers were going to be the foundation to the entire area. Before the pavers could be laid we had to re-route several downspouts that drain from the gutters on the back side of the house. 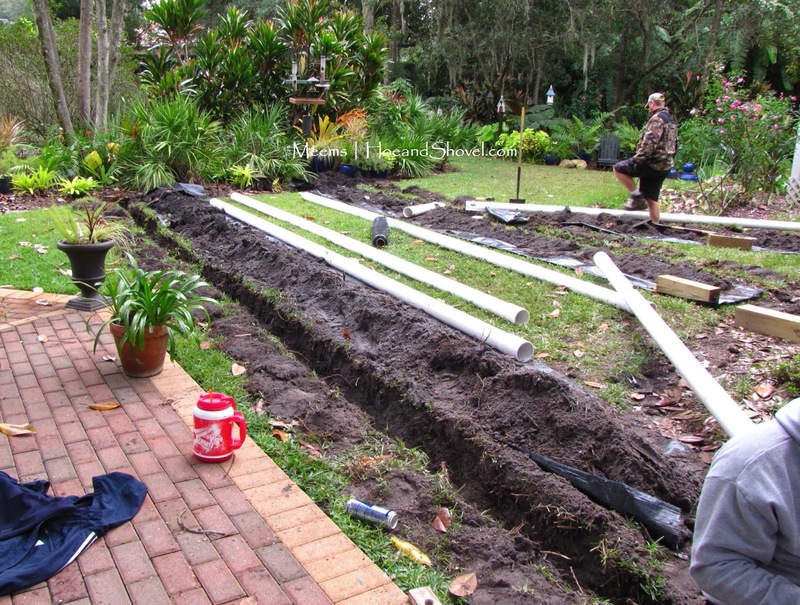 That involved digging trenches, laying pipe and dropping a couple of underground box drains out in the middle landscape bed for overflow. The whole place felt a mess that day. No, it was a mess. It was also cold. So. Cold. that November day. I made soup for the crew. Thick, hot, made-from-scratch chicken and wild rice warm-your-tummy goodness.Soup has nothing to do with my story. 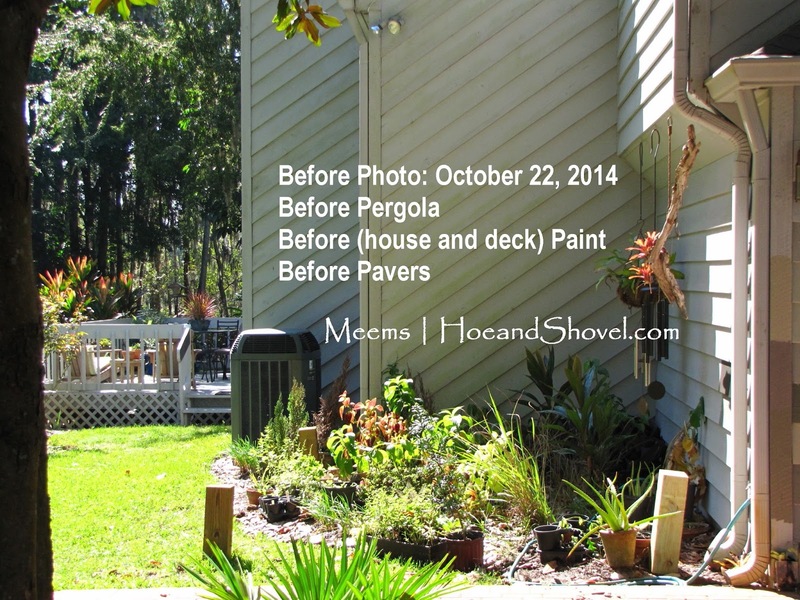 The paver company was not the same as the pergola company. There was some finagling of scheduling because they had to work around each other. Before the pavers were put down Garden Carpentry wanted to slip in and get the four corner posts in place. 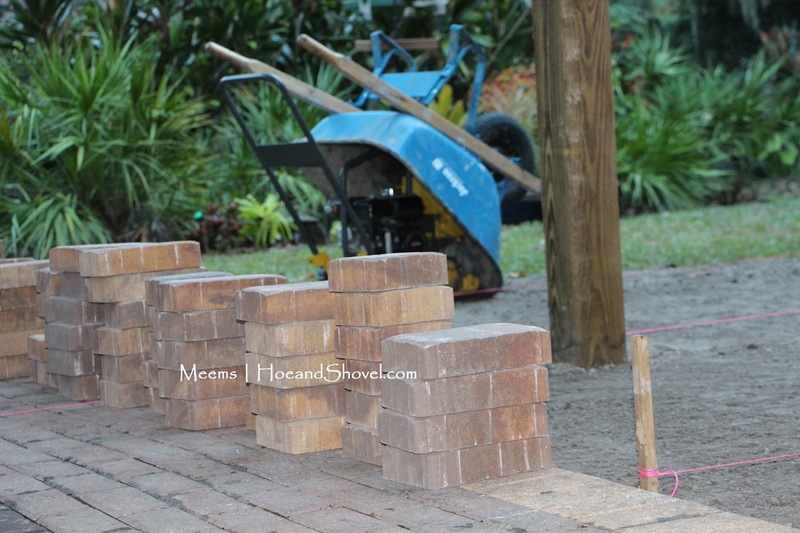 It's easier to put pavers around the post than to go through the pavers to set the posts. 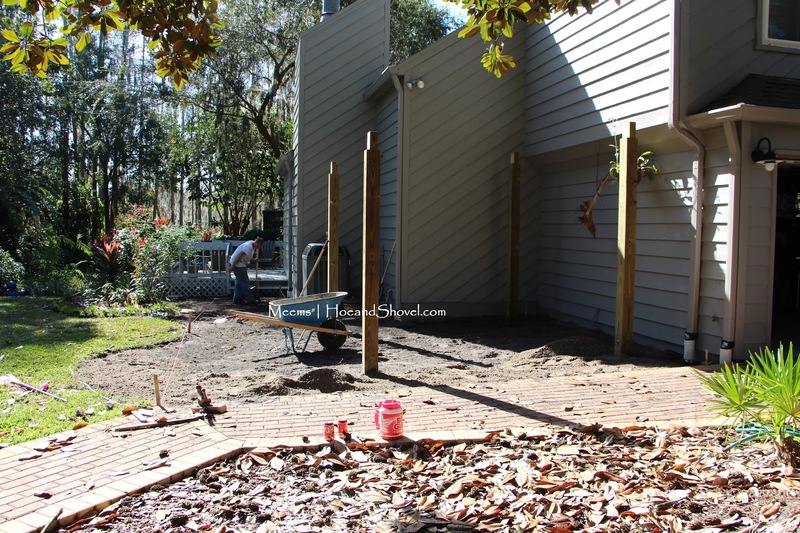 Once the posts were in place and 24 hours passed for the cement to set up, the paver company was back to clear the lawn and get started with the patio. Bye, bye useless grass. It seemed like a pretty quick 2.5 days to get the pavers all in place. It was December (2014) so I was pretty busy with Christmas hustle and bustle in the middle of all of this. There was an oddly shaped, but convenient, walkway of pavers already in place when we moved here (visible in the foreground above). We decided to extend the new pavers from that awkward walkway to under and beyond the pergola area all the way over to the open back deck. Now the space flows from one side to the other of the back garden. 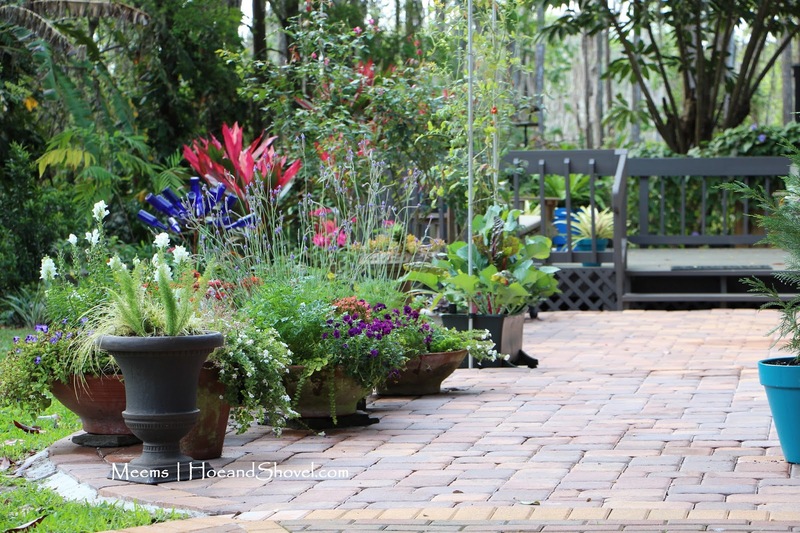 The pavers that extend out beyond the pergola create an ample walkway to the deck. 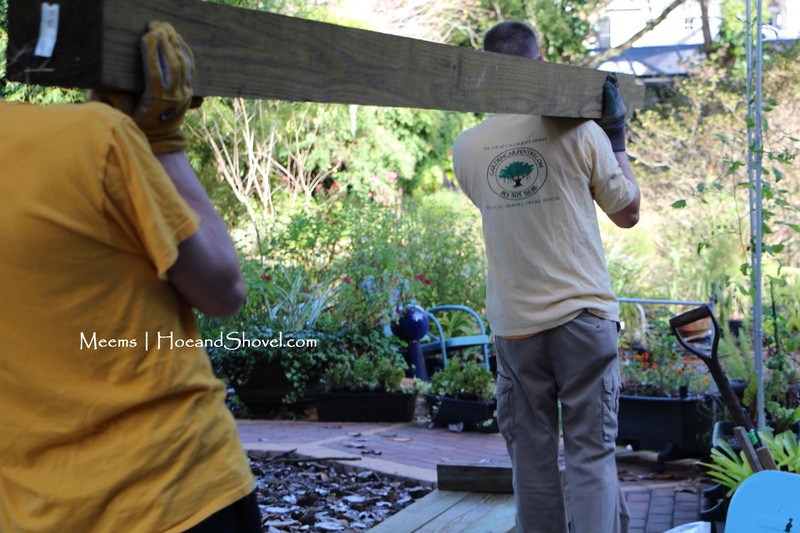 It took a few weeks of back and forth discussions preceding the construction of the pergola to get the final plans in order. These are the rafters. Aren't they beautiful? The end cuts are called ogees. Turns out there are lots of design options for ogee cuts. (I had to learn all this stuff as we went along). Each rafter has to be individually cut. I wanted my rafters to extend out as far as possible over the lintels. They ended up being a little more than a 2.5' overhang. The smaller cross bars on top are called purlins. Aren't you glad you know all that now! 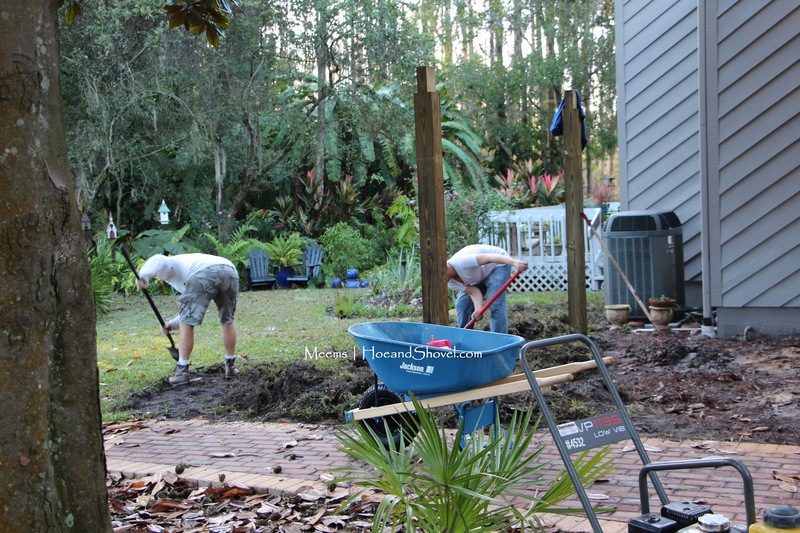 Once Garden Carpentry was on site to start the pergola it was completed in about 3 days. I really appreciated how they worked with me to let me give my input on the design. I knew what I had in mind and with their expert knowledge the collaboration turned out to fit my vision exactly. In my mind the pergola was to be a multi-purposed work-station, eatery and gathering place. I wanted a place to gather my gardening supplies and a central spot to work from. It had to be large enough for a small table and a seating area. We had it covered with a clear polycarbonate roof to keep the rain out as much as possible. All the wood was stained with *Espresso* opaque Olympia wood stain. You can see all my paint samples painted on the right. The house was a light gray. 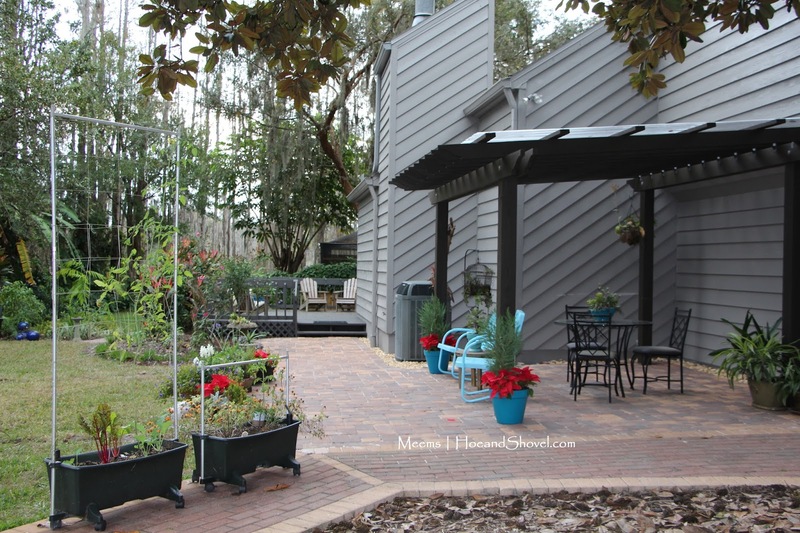 We painted it a deeper shade of gray (Dovetail Gray -Sherwin Williams) right before the construction of the pergola started. The alcove where the pergola was to go was created by the angles of the outer walls of the house. It was a pretty useless area. The garage is just to the right of this photo. The alcove had become a messy gathering of all my grow pots and anything else I hadn't yet found space in the garden for yet. Immediately the new structure made a world of difference in the overall garden environment and added to the architectural aspects of our newly acquired home. 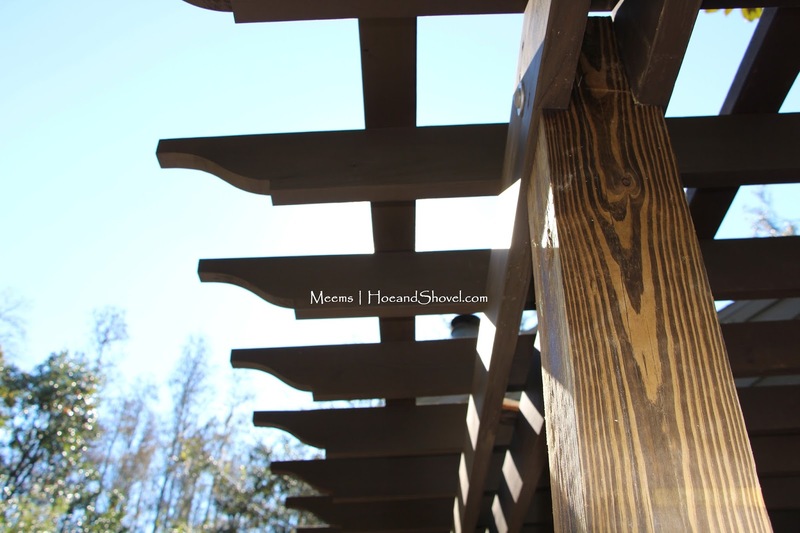 The pergola improved the balance of the back side of the house tremendously. It was as if that strange, ill-used alcove was waiting for a pergola. You can easily see how connecting the walkway all the way across to the open deck made sense. Remember the re-purposed painted ladder project? You can see them here. I'm benefiting from the convenience of all my seedlings and sprigs of rooted plants being right there together under this roof. It's so easy to water them (and control how much water/sun they get) with a hose nozzle also under the pergola. The perspective looking from the yard back toward the house. The entire space has become a welcoming entry way so-to-speak into the back yard. 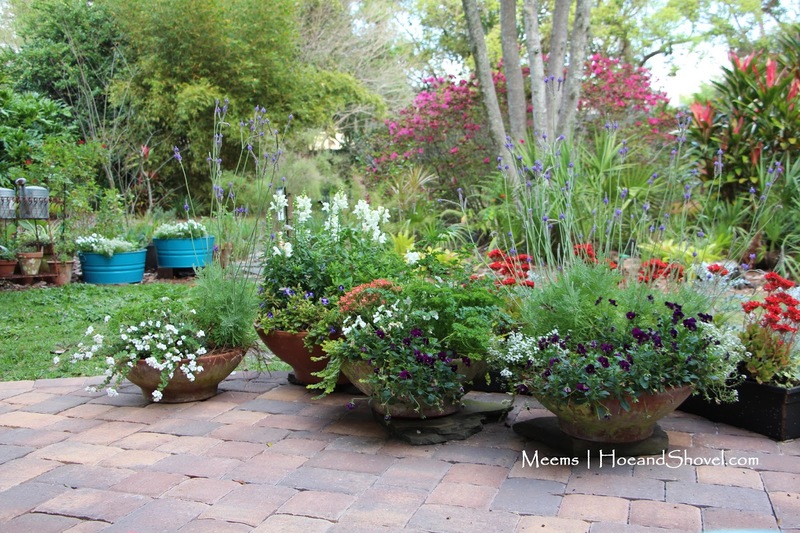 I use low container bowls on the edge of the walkway to keep the view open. They are filled with sun-loving herbs and flowers. I couldn't be more pleased with the results of the pavers and the pergola. We have spent so many wonderful minutes reading, eating and gathering with friends and family under the cozy pergola. 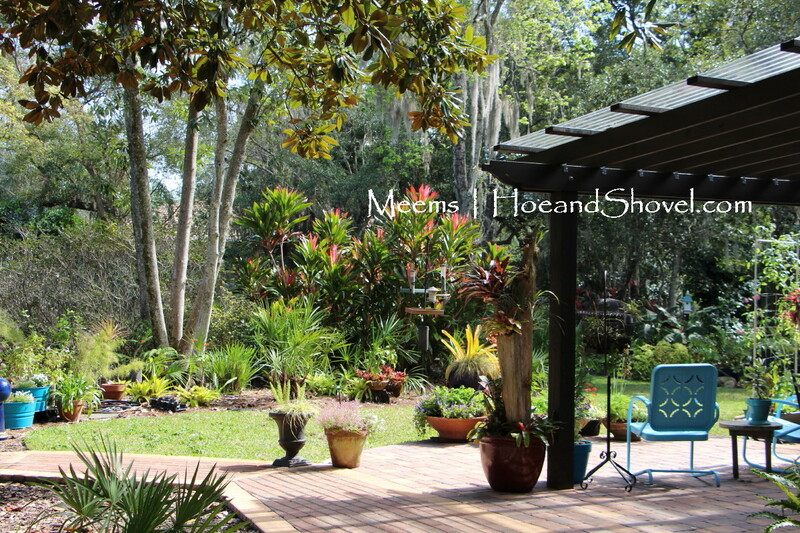 The pergola addition is one of those things that will be enjoyed for years to come. As time goes on I'm sincerely feeling like this new home is MY home. Dreams most certainly do come true and your dream come true is beautiful and oh so useful too. You will enjoy this constantly. 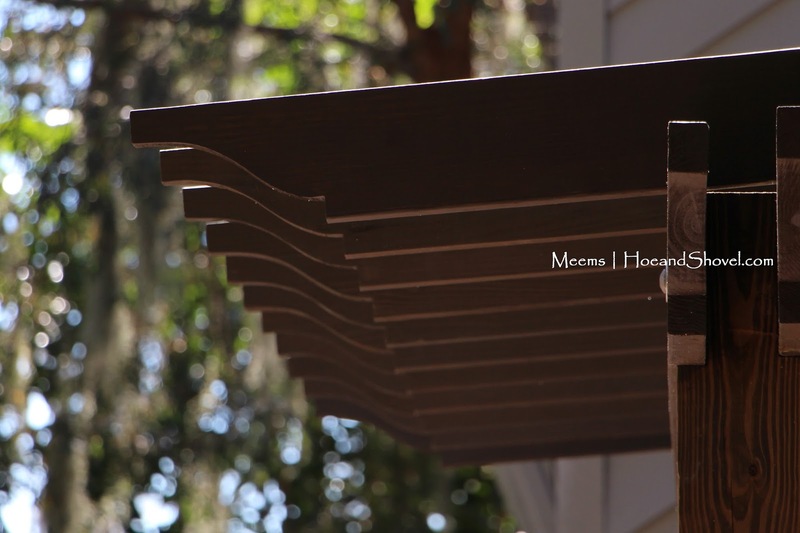 Love your new pergola. It does pull together your back walkway/deck etc. Thank you Lisa... I still stand there looking at it in amazement at what a difference it has made. Oh, my. It is so incredible. So happy for you that you have the pergola of your dreams. Are you planning on growing anything on it? It's absolutely perfect! Loved reading every minute of your journey and look forward to your next creative project. 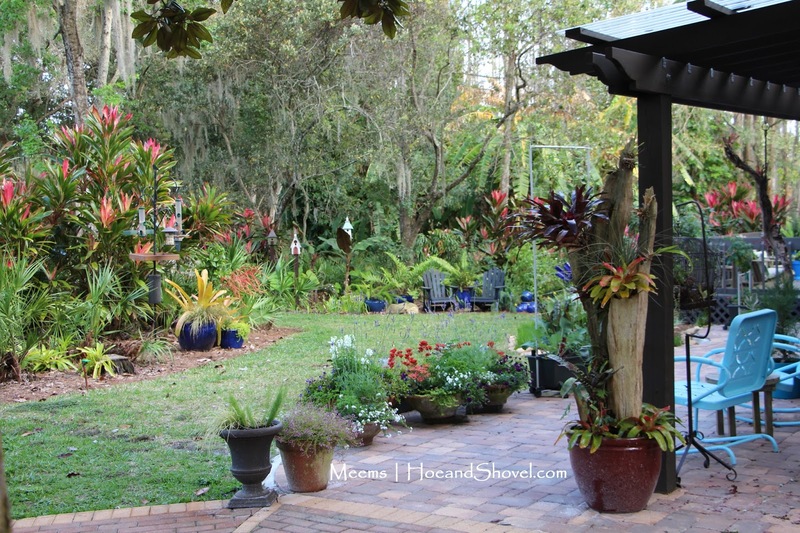 I just love the bromeliad tree and yes, you have created balance with the pergola and pavers from the house. And it was a LOT of reading Diane! Thank you. 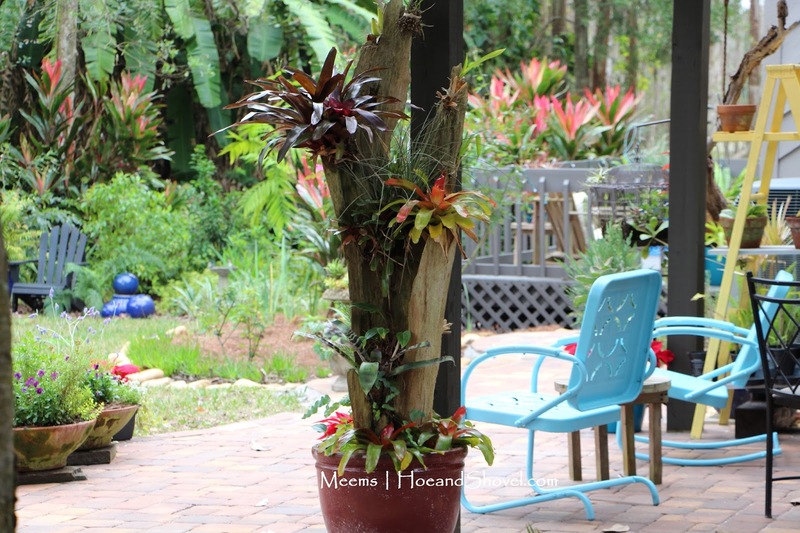 I'm so happy I finally found a good spot for my bromeliad tree. It seems to be a good place for it. Oh my! 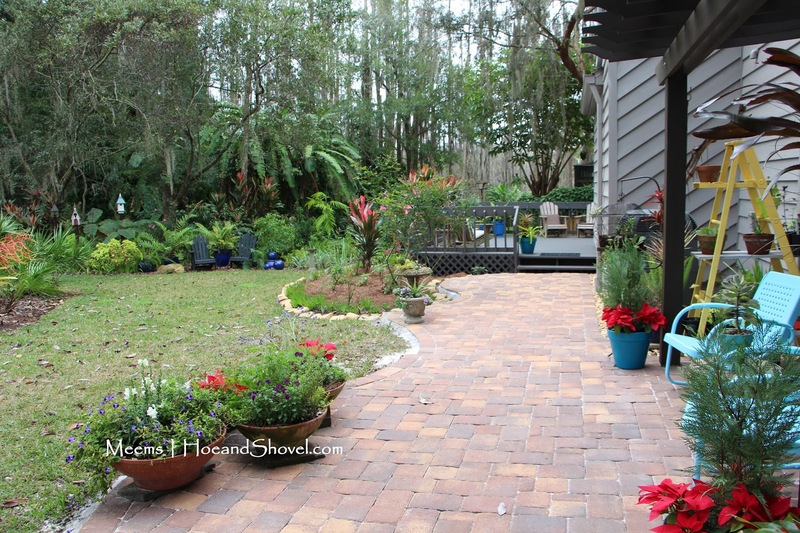 Just did a google search for blogs about Florida gardens and your site came up first. How lovely! As a gardener "wannabe," I have a feeling I could learn a lot by reading your posts! I'm so glad to have you visit. Please feel free to come back often. 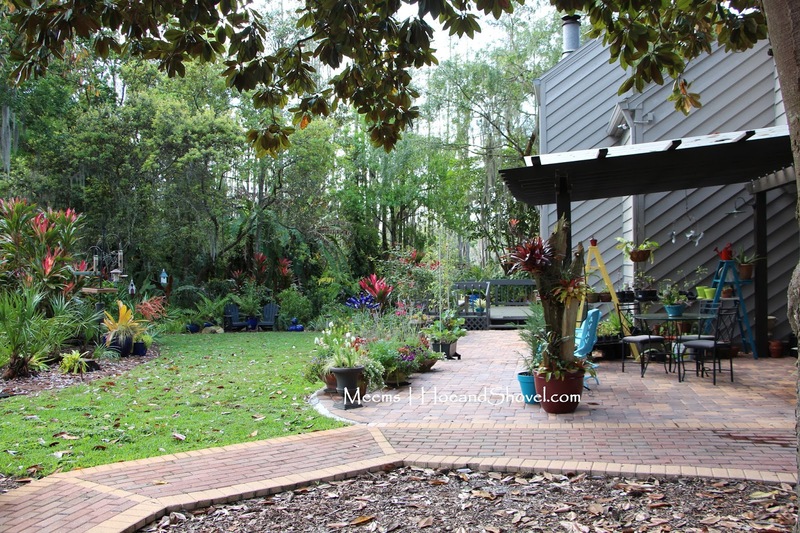 Wonderful place to enjoy your gardens! It has been a refreshing change and so useful at the same time Freda. You've certainly made this new house into your home! Lovely! It was definitely worth the effort. 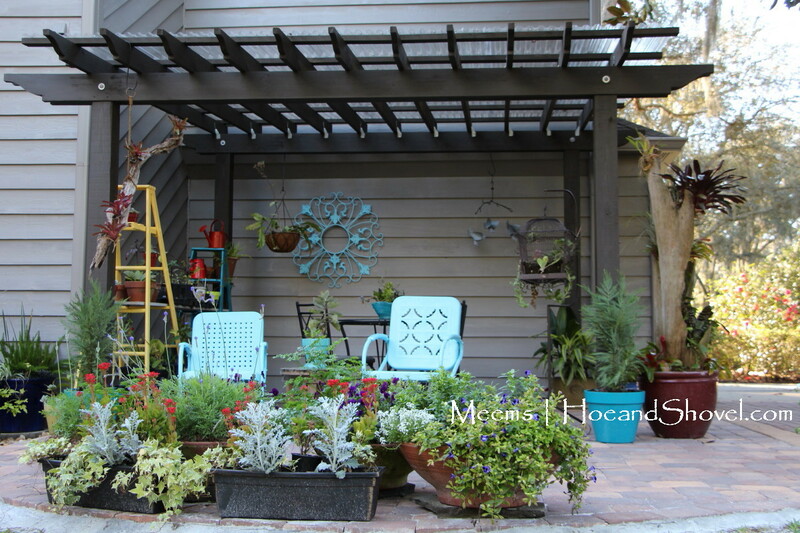 A pergola is such a lovely addition to your outdoor space. What a beautiful garden structure that was built there. The garden and polycarbonate roofing work are what I find amusing. How long did it take to complete that type of project?